Sunday August 9 on Governors Island, NY. Kobi Arad (Israel), Ezra Bookman, Leah Caroline, Asherah Cinnamon, Filipe Cortez (Portugal), Shira Dicker, Susan Hoffman Fishman, Tobi Kahn, Elena Kalman (Ukraine-US), Amichai Lau-Lavie, Miryam Madrigal, Patricia Eszter Margit (Hungary), Tali Margolin (Ukraine/Israel), Bronwen Mullin, Elisa Pritzker (Argentina), Cynthia Beth Rubin, Noaj Sauer (Argentina), Willa Schneeberg, Paul Solomon, Maayan Kossof Stein (Israel), Renata Stein (Germany), Sarah Zell Young, Yona Verwer (Netherlands), and many more. Names in bold are Jewish Art Salon members. Governors Island: 172 acre island in the heart of New York Harbor, is only 800 yards from Lower Manhattan, and even closer to Brooklyn. 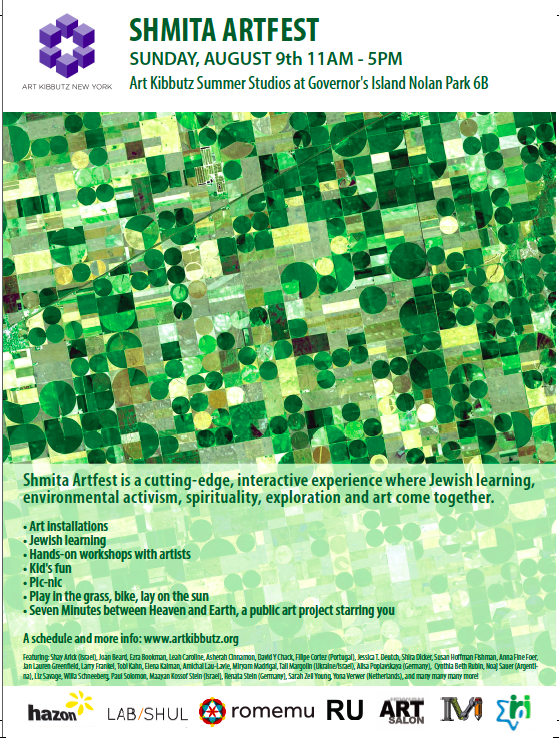 It is a world unto itself, unique and embodies the Shmita concept: a fallow land revitalized by environmental and cultural organizations, re-purposing old buildings and land with a ‘no waste’ policy. Timing: Plan to arrive at the ferry landing at least 30 minutes prior to your desired arrival time. For a complete timetable of events, please check out the festival lineup. Directions: Governors Island is accessible by two FREE ferries, one leaving from Manhattan and one leaving from Brooklyn. Manhattan Ferry departs from Battery Maritime Building at 10 South Street near Staten Island Ferry, accessible from the 1, 4, 5, N, R, J or Z trains. Brooklyn Ferry disembarks from Pier 6 in Brooklyn Bridge Park, by Atlantic Ave., accessible via R, 2, 3, 4, 5 trains & B23, B65, B61 buses.